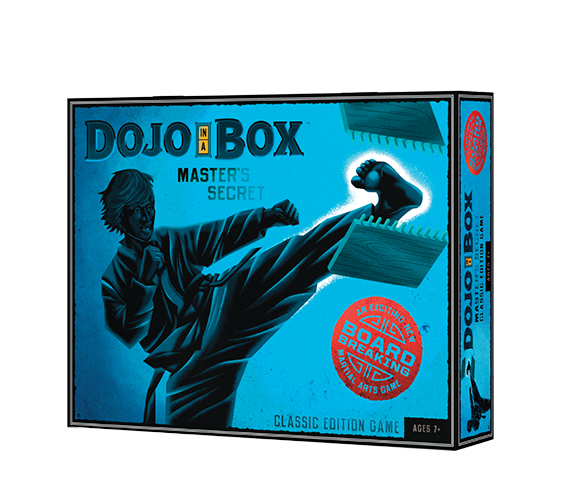 Dojo-In-A-Box board breaking game, Great for after school and Summer Camp programs, (includes (3) boards) is the most fun and greatest action-packed martial art game ever. Unlock unbelievable power using the same martial art techniques taught in dojos around the world. Turn the Monkey loose! Go wild…it’s the game that’s meant to be broken. Any number of players can play. Smash your way to the top of your tribe with explosive fun, strategy and power. Spin the wheel, pick your board color and strength, and break using real martial arts techniques in the included instructional manual. Break the harder board, score the higher points. Comes with three different strength rebreakable martial arts boards, game spinner, secret instruction training manual, scorecard pad and hours of explosive fun.